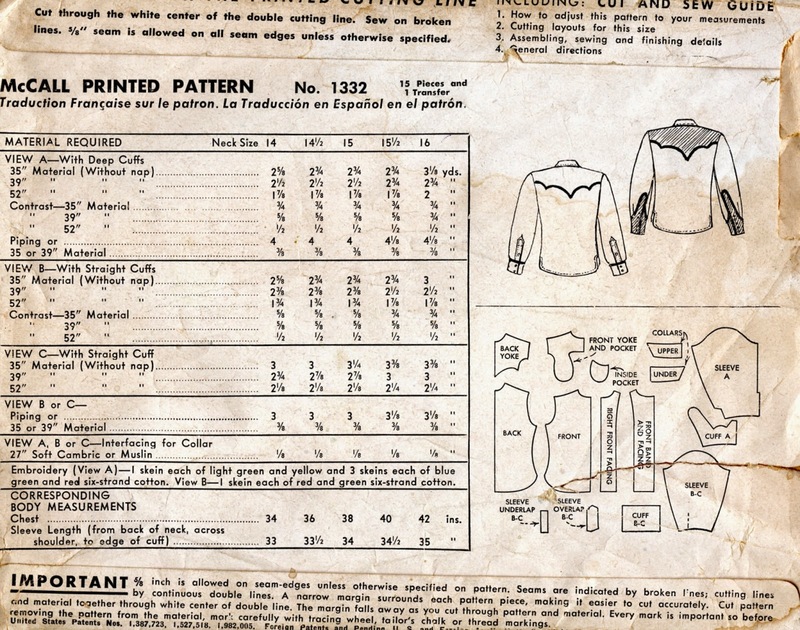 This is the earliest western shirt pattern I've found thus far. Unlike some of the later western shirt patterns, this is purely a fancy dress shirt - no workaday checks or stripes are illustrated here. Note the spectacular embroidered cuffs on Mr. A's shirt. But why did McCall think this pattern was necessary to their product line? 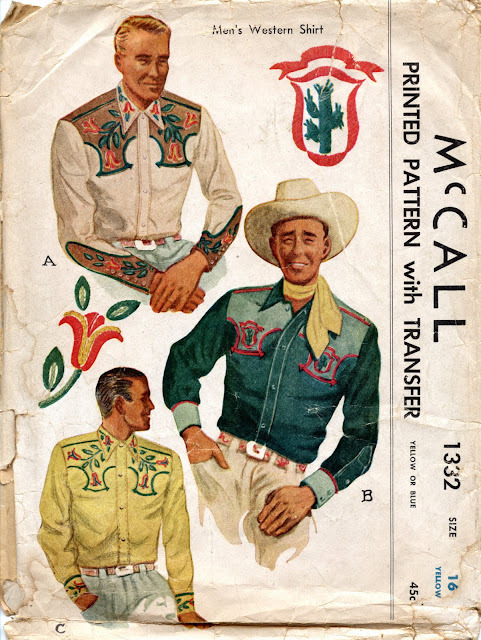 Who was buying such flamboyant western shirt patterns? Did ranch wives make these shirts up for their menfolk for rodeo days and Saturday night dances? Did wealthy dudes wear these while carefully rusticating at ranches catering to their dreams of a simpler, more direct life? Did anybody east of the Mississippi wear these splendid shirts? I love the pattern. I have a newer one from the 70's when Urban Cowboy renewed interest in the western look. Love it! Interesting questions. I have see old photos of ranching people from this area, they wore either plain work clothes or the normal styled dress shirts. I may have to make a trip to the historical museum for further research. Outside of movies, I have never seen shirts worn this fancy. My grandpa wore these shirts all the time. My grandma made them and did all the fancy embroidery work on them. Also, Monty Montana (a rope perfromer who was in the Rose parade every year) wore fancy wstern shirts like this. My parents took me to see him when I was a child. I have a litle boy's western shirt pattern from this same time period. That's so interesting! I have so many questions! Did your Grandma make workaday shirts also, or just the fancy ones? How many did she make in a year? Have any of them survived in the family? These shirts were for special occasions, dances, the rodeo (after the ride) and for dudes at dude ranches. Now that's a term you don't hear much anymore. My ranching grandmother made regular shirts and night shirts and when they wore out they went into patchwork quilts. Hi I Live in germany how i can get this pattern .du su sell and can ship the pattern? Hello Raquel. The patterns on this site are not for sale. Many of them show up on eBay from time to time, so that's probably your best bet. Good luck.